the UGC: Mediocre Recipe Reviews. You're Welcome. Mediocre Recipe Reviews. You're Welcome. I made this on the Friday before the 4th because I got to leave work early and I figured I'd use the extra time to make something proper for dinner. It's a good thing I had sort of planned ahead, because you kind of need to with this one (unless you normally start making dinner around 3pm). Don't get me wrong, this galette was tasty and totally worth the trouble, but it's a fussy recipe. Some ingredients need to sit in the freezer or the fridge before using. The zucchini need to be salted so it can weep. They're not difficult tasks, but they're things that take time, so planning in advance for this one is good. Despite it's fussiness, I would totally make it again. We both ate some the night I made it, and then kept eating the leftovers (cold, right from the fridge - still delicious!) all weekend. Annnd, the nice thing about a galette is that you don't need a specific size pan, and you can make it any shape you want. I decided to go square because all of my baking sheets are square. Whatever shape you make, it'll be delicious. 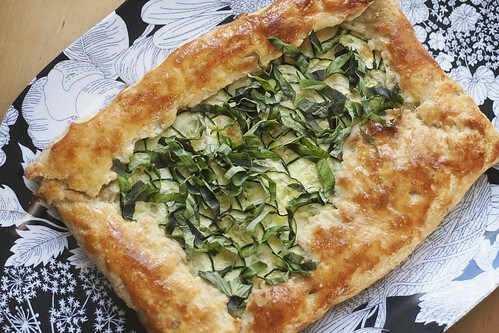 I made this last week to get rid of all the left over zucchini I had bought to make the galette. I'm no stranger to the frittata, but decided to give this version a whirl. My usual go-to recipe has you keep the frittata on the stove for a while before you go to the oven, which isn't a bad way to go, but I kind of liked the "put everything in a pie plate and bake it in that" approach. It gave me some time to wash a few dishes and set the table (we had a dinner guest!). I did throw it under the broiler for a minute or two just to crisp the top a bit, and it turned out fabulous. Oh, besides the zucchini I used some red onion, a green bell pepper, some leftover mozzarella and some basil. I served some sour cream and cliantro pesto to go along with it, and they were the perfect toppings. I am so making this again. It was the perfect way to clean out the fridge. From what I can tell, chap chae is usually a side dish. At least, that's how I've always had it in Korean restaurants. It happens to be one of my favorite parts of a Korean meal, so I wanted to give this recipe a try. The only ingredient I had trouble finding was the noodles. I checked the asian grocery store closest to me, and they only had one version to choose from, but they weren't the noodles I was expecting (right ingredients but weird appearance). I bought them anyways, and the dish turned out tasty, despite the slightly weird noodles. The verdict form the boy-fiance was, "It tastes good, but I don't like the noodles." I guess that means the leftovers are ALL MINE. Next time though, I'm going to make a specific trip to the Korean market for the right noodles. All Lemons All the Time! Have I mentioned that I love lemons? They're one of my favorites, and I've been making tons of lemony things the past few weeks. Mostly lemon bars. I even busted out the ice cream maker to make some lemon sorbet, and tonight I made some lemonade because when your friend gives you lemons from her tree but you don't want to turn on the oven or the ice cream maker, you make lemonade. And on a totally unrelated note, anybody have good recommendation for stopping the itch form mosquito bites? We went on a short camping adventure this weekend and I think all 10 (possibly more) mosquito bites happened within the first 15 minutes of me standing in the redwood forest. I've got a couple of suggestions from Facebook peeps, but any other suggestions are welcome! \n\n\nDespite being a little stressed out as of late, I have been cooking. With actual recipes! I know! Being in the kitchen is a good excuse not to be sitting at my computer, so I've been trying to find the time. And it makes me happy to be slicing and dicing and listening to some good tunes. It's probably what's helped keep me sane these past few weeks. Here's what's been cooking:\n\nZucchini and Ricotta Galette\nI made this on the Friday before the 4th because I got to leave work early and I figured I'd use the extra time to make something proper for dinner. It's a good thing I had sort of planned ahead, because you kind of need to with this one (unless you normally start making dinner around 3pm). Don't get me wrong, this galette was tasty and totally worth the trouble, but it's a fussy recipe. Some ingredients need to sit in the freezer or the fridge before using. The zucchini need to be salted so it can weep. They're not difficult tasks, but they're things that take time, so planning in advance for this one is good. Despite it's fussiness, I would totally make it again. We both ate some the night I made it, and then kept eating the leftovers (cold, right from the fridge - still delicious!) all weekend. Annnd, the nice thing about a galette is that you don't need a specific size pan, and you can make it any shape you want. I decided to go square because all of my baking sheets are square. Whatever shape you make, it'll be delicious.\n\nClean-Out-The-Fridge Frittata\nI made this last week to get rid of all the left over zucchini I had bought to make the galette. I'm no stranger to the frittata, but decided to give this version a whirl. My usual go-to recipe has you keep the frittata on the stove for a while before you go to the oven, which isn't a bad way to go, but I kind of liked the \"put everything in a pie plate and bake it in that\" approach. It gave me some time to wash a few dishes and set the table (we had a dinner guest!). I did throw it under the broiler for a minute or two just to crisp the top a bit, and it turned out fabulous. Oh, besides the zucchini I used some red onion, a green bell pepper, some leftover mozzarella and some basil. I served some sour cream and cliantro pesto to go along with it, and they were the perfect toppings. I am so making this again. It was the perfect way to clean out the fridge.\n\nChap Chae\nFrom what I can tell, chap chae is usually a side dish. At least, that's how I've always had it in Korean restaurants. It happens to be one of my favorite parts of a Korean meal, so I wanted to give this recipe a try. The only ingredient I had trouble finding was the noodles. I checked the asian grocery store closest to me, and they only had one version to choose from, but they weren't the noodles I was expecting (right ingredients but weird appearance). I bought them anyways, and the dish turned out tasty, despite the slightly weird noodles. The verdict form the boy-fiance was, \"It tastes good, but I don't like the noodles.\" I guess that means the leftovers are ALL MINE. Next time though, I'm going to make a specific trip to the Korean market for the right noodles. \n\nAll Lemons All the Time!\nHave I mentioned that I love lemons? They're one of my favorites, and I've been making tons of lemony things the past few weeks. Mostly lemon bars. I even busted out the ice cream maker to make some lemon sorbet, and tonight I made some lemonade because when your friend gives you lemons from her tree but you don't want to turn on the oven or the ice cream maker, you make lemonade.\n\n\nAnd on a totally unrelated note, anybody have good recommendation for stopping the itch form mosquito bites? We went on a short camping adventure this weekend and I think all 10 (possibly more) mosquito bites happened within the first 15 minutes of me standing in the redwood forest. I've got a couple of suggestions from Facebook peeps, but any other suggestions are welcome!